Nice Examples of Design Spotted Everywhere... even on our plates! 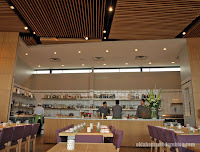 A few weeks ago we made the short trek up the turnpike to Oklahoma City and had lunch at a unique restaurant, while enjoying some modern architecture. The two come together at a new retail development called Classen Curve. And our meal was a treat for the eyes and the tummy! The Curve project is near the intersection of Classen Boulevard and I-44, on NW Grand. 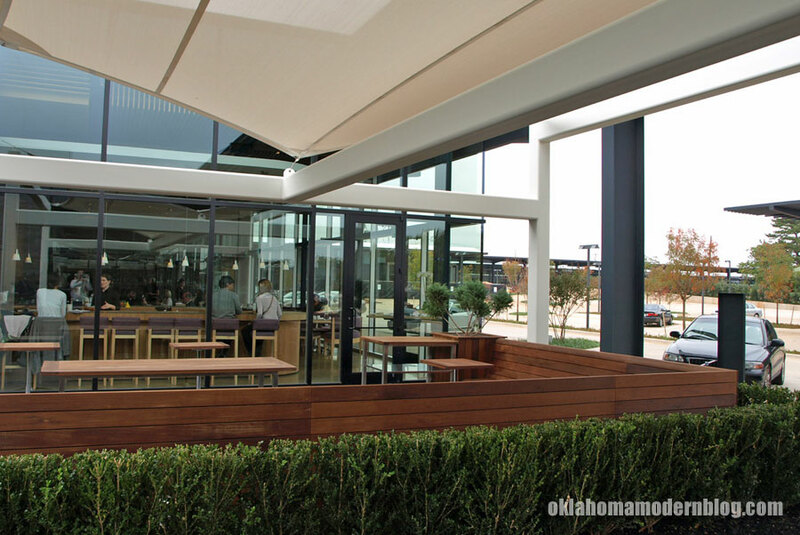 It's another product of Chesapeake Energy and designed by their favorite firm, Elliott + Associates Architects. If you've ever visited Pops in Arcadia, the Chesapeake Boathouse or the Route 66 Museum in Clinton you've seen their work before. Clean lines and simple geometry typify their work, and Classen Curve is no exception. 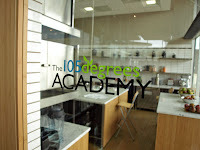 The only establishment up and running in Classen Curve at the time of our visit was 105 Degrees. 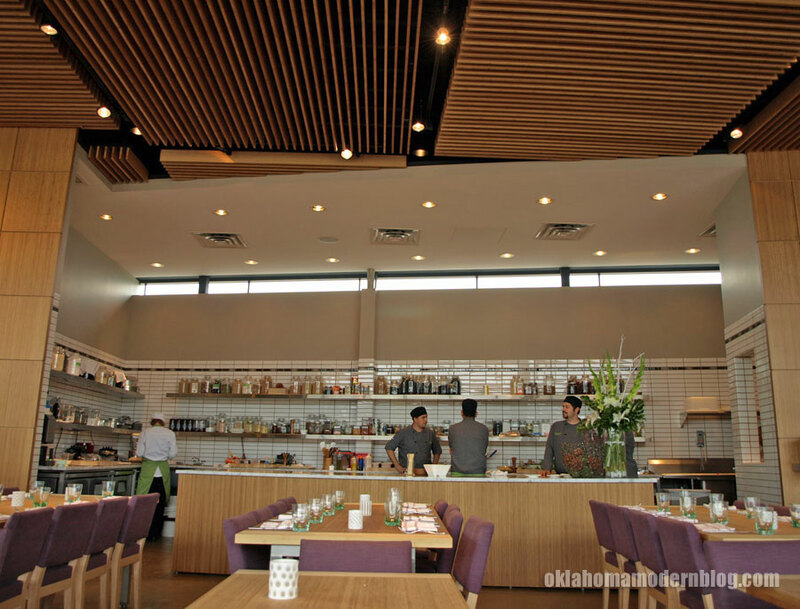 This is a raw food restaurant that also features a small market and chef school. A surprising array of entrees and desserts are available, frankly much more than I was expecting. The 105 Degrees Academy offers classes and chef certification in preparing food below the school's namesake temperature.The interior of the whole establishment is focused on renewable and eco-friendly materials. Our lunch was quite good. Jackie was reveling in an entire menu of vegan choices. We both thoroughly enjoyed the Heirloom Tomato Lasagna- which featured a raw version of pasta that uses a drying technique instead of baking. If that sounds unappealing, trust me- it's actually quite delicious. And I highly recommend the Frozen Blood Orange Cheescake. Afterward we walked off a few of the calories touring the Classen Curve. The storefronts were mostly empty, but overall there's an open feel to the entire space. Overhangs are open and windows are extra large. The center will eventually offer 92,000 square feet of retail space in a park-like setting. Storefronts face inward, toward the people using the center, instead of the passing traffic. Landscaping was still being completed but appeared to be an integrated component as opposed to an afterthought satisfying some arcane zoning requirement. I'm looking forward to seeing the development once completed. And another tasty lunch!